Behold this horrid wretch before you, and ask yourself: how did Donald Trump beat this thing out of the first place in Time Magazine’s Most Influential People of 1998? Not that any of that happened, of course. But imagine. The thing I wanted you to take home from this is that no matter how awful the shape, the design in itself is instantly recognizable. And Pikachu, the loveable little thing, would probably give Trump a run for his money in terms of lovability versus fame (then again, a lot of Pokémon probably would). Most people recognize at least one Pokémon, and everyone who went through the original craze probably has a favorite one. The initial 150 Pokémon (the so-called Generation I) have become almost iconic. But the Pokémon franchise has now existed for over twenty years total, and the 150 Pokémon have now been expanded to a whopping 802. And as the Pokémon universe as a whole has been growing along, the Pokérap could now be dubbed a Pokérhapsody. And some people, including those who dislike stupid puns, aren’t too happy about that. This is one of the main problems the Pokémon fandom has been dealing with over the past few years: with each new entry into the series, less and less people recognize all different Pokémon. For a series that thrives on collectability (as reflected in the show’s tagline, “Gotta catch ‘em all!”), one would say that more Pokémon would thus equal a better game. Sadly for Nintendo, not everyone agrees. One of the main points of conflict is the design of the new Pokémon, the current generation (Generation VII) indeed being a far cry from the original 150. In no way should design choices be underestimated as a major key to the player’s appreciation of Pokémon. The way the Pokémon look, the way these looks relate to their abilities, and their general cuteness or coolness all play a decisive role in the player reception. Nintendo’s team has operationalized these elements in quite a few clever and inventive ways. Naturally, these ways have not remained exactly the same over a span of twenty years. Players have been noting these differences for a while now, and the new design approach is quite visible indeed. The original designs mostly have sharp edges to them, and small, concentrated pupils. Note the predominantly triangular shapes. The result is a Pokémon that looks more focused, a bit more cranky, or cool, so you will. Most of the Generation I Pokémon with round-eye design later evolve into having a triangular shape. This is the case for Charmander, Squirtle, Psyduck, Poliwag, Magikarp, and the list goes on. On the other hand, the new designs show eyes that avoid sharp edges and triangular shapes. The eyes are mostly round with large pupils which are often accentuated by a distinct highlight. The result here is that the Pokémon looks “softer”, for lack of a better word. The eyes more often seem fully opened, whereas the triangular shape implies a furrowed brow. Large pupils create a cuter look to the Pokémon as opposed to the focused glare of the tiny pupil. Only bigger, and evolved Pokémon tend to have triangular eyes in the new designs. This design choice might be one of the reasons that makes old players look at the newest generation and say, “Where are the cool ones?”, as they glance over the newest additions. However, it should be noted that it is always easy to cherry-pick contrasting designs when your pool of choice is 802 samples big. There are also some distinct similarities that occur within each new generation of Pokémon. For example, here’s Throh. He’s a Generation V fighting-type Pokémon, who typically wears what seems to be a judogi. Poor little Throh here has frequently been bashed for the fact that a Pokémon wearing clothes doesn’t make all that much sense. Where does it find a tailor? Did it hatch from the egg like that? Is it part of its skin? We might never know the answer (although you’ll probably find something if you dig deep enough, but why ruin the mystery?). It should then be said that clothed Pokémon have always been a part of the original set. Here we also have Nicki Minaj, the racist stereo-type Pokémon. Jokes aside, Pokémon such as Machoke, Primeape and Jynx have all been known to be dressed, be it with undergarments, boxing gloves or robes. What’s more, Pokémon are also known to carry around props as they’re born, such as with Farfetch’d and its leek, Alakazam with its akimbo spoons or Cubone’s skeletal attire on which fan speculation still runs rampant. The conclusion should be drawn that Pokémon with clothes and props are a constant feature throughout all generations, and the attributes often create a large part of the Pokémon’s character. As tastes can differ, there has also been a large influx of Pokémon deemed ugly within the newer generations. They are accused of looking uninspired, or like straight-out trash. Like this little guy over here, Trubbish. He is, quite simply, a bag of rubbish, and it’s rather obvious the designers went for just that. 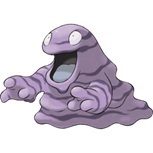 While some may call it uninspired, a tradition of straight-forward and simple Pokémon can also be traced back to the original generation, such as with Grimer, who is a blob of grime. It wouldn’t be too far-fetched to say that Trubbish comes from a very similar line of thought that might have originated with Grimer. Both are poisonous, and resemble a result of human waste coming to life. Similar straightforward designs in Generation I can be found in Butterfree (a butterfly), Seel (a seal), Krabby (a crab), Horsea (a seahorse), and many more. The outside world and its animals, objects, and backgrounds have always played a major part in how Pokémon are designed. As you might have noticed, many of these design grievances revolve around comparisons between the first generation of Pokémon and newer ones. There is a final gripe on this topic I would like to shed light on, which is the general adaptations of Generation I Pokémon. 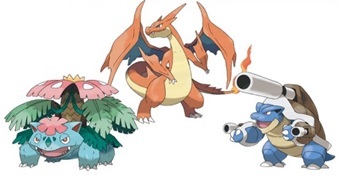 Behold here, the “mega evolutions” of the three original starter Pokémon. They are alternate forms which can be summoned in the game, and they have caused quite some heavy backlash. If I were to guess why, I suppose nostalgia is the biggest factor as to why many people don’t like these designs. When certain characters with a large enough cultural impact in their wake are changed, or altered, people often tend to feel robbed. The characters are treated as idols that are not to be tampered with. Similarly, this might also be the reason why people dislike having certain buildings (dis)appear over their hometown skylines. It could also be traced back to why people hate plastic surgery with celebrities, Michael Jackson and Renee Zellweger being prime examples of people who were heavily shamed because they altered the look so many people had come to love them for. The reasons as to why people are so sensitive to nostalgia could provide enough material for multiple essays. Is nostalgia an elaborate coping mechanism? Are the icons of nostalgia inseparable parts of our identities? Perhaps it all revolves around the sense of belonging and community that comes along with great collective memory? Whatever it could be, nostalgia in practice is never a subject one can look at without a colored lens. It is quite feasible for people to grow defensive over their views, even though their views might not be all that reasonable; nostalgia can have that power. It is then a shame that these icons (memories of Pokémon, your hometown skyline, celebrities) become viewed as public property instead of someone’s personal property. The childhoods are of the people, but the icons are not. So some people like the new designs, and others don’t. The one thing I’d like to stress is that new Pokémon are different from the ones back in the day, and that this is a very natural thing. The design approach, however, is still stocked with the same tradition and convention that the original Pokémon were designed with. Ken Sugimori, the original artist, still stands at the head of the entire process of Pokémon creation, after all. The ideas behind the Pokémon haven’t changed all that much, but we, as a generation of people raised on Pokémon, have. When you’re looking at the new designs, a good exercise might be to try and place yourself into the mindset your inner ten-year-old, and see if you wouldn’t want to catch any of these new Pokémon. After all, the game is still marketed toward children. And if you start taking a children’s franchise too seriously, then you might want to take the hint and let it go altogether. You might not be the target audience anymore, and at the end of the day, maybe that’s how it should be. The original chubby Pikachu remains superior to any new design or form—and that’s an objective fact. I did the math.